An Image Of A Child Can Change The Way We See The World : Goats and Soda The photograph of the 3-year-old Syrian refugee who died is part of a long tradition: an iconic picture that shows a child at the mercy of tragedy. Family members, reunited after fleeing Kosovo, pass 2-year-old Agim Shala through the barbed wire fence into the hands of his grandparents at a camp in Albania. The photo was taken on March 3, 1999. By now, you've probably seen the photo of Aylan Kurdi, the 3-year-old refugee from Syria who died with his 5-year-old brother and mother after their small rubber boat capsized on its way to Greece. You might remember his Velcro shoes. His red shirt. His lifeless body lying face down in the sand. The image has opened a debate about the ethics of publishing photos of children suffering and dying. But regardless of one's position, the photo is now part of a tradition — another iconic image of a child that has shaped our understanding of global events and that is likely to live on in our minds for years to come. "When we see pictures of a dead or dying child, I don't care who you are, where you are, you're moved," says Maggie Steber, a documentary photographer and longtime contributor to National Geographic who served on this year's Pulitzer Prize selection jury. Terrified children, including 9-year-old Kim Phuc (center), flee after a South Vietnamese plane dropped a napalm bomb on June 8, 1972. The girl had ripped off her burning clothes. Steber cites photographer Nick Ut's 1972 photo of a 9-year-old Vietnamese girl, Phan Thi Kim Phuc — often called "Napalm Girl" — as one of the most influential images in history. In the photo, Phuc is running naked down the street after being burned by an explosion. She later recalled removing her clothes and yelling "too hot, too hot," as she ran along the road, her back so badly scorched that she spent more than a year in a hospital and required more than a dozen surgeries. "For people to see that photo and to realize that that was really going on, and having television bring the war into people's living rooms, that was powerful," Steber says. She believes that's partly what caused Lyndon Johnson to bring the Vietnam War to an end. 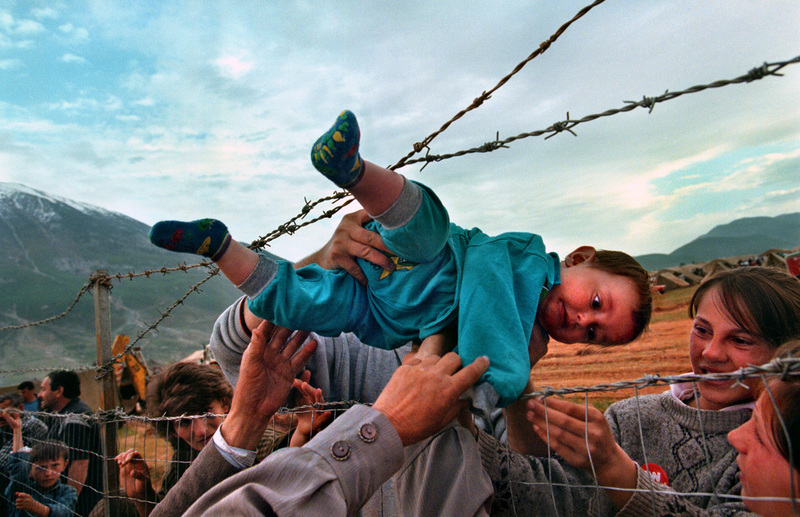 In 2000, former Washington Post photographer Carol Guzy spent time at a refugee camp in Albania during the Kosovo crisis and took a photo that won the Pulitzer Prize — one of four in her career. It depicts a young boy being passed through a barbed wire fence at the border. "It's actually a joyful photo," Guzy says. "Families that had escaped ethnic cleansing did not know if their loved ones had survived or not; [they] were lined up along that fence." When one family saw relatives on the other side of the barbed wire, they celebrated and handed their young children back and forth while waiting to be reunited. Guzy says images of children are particularly moving. "It's something about being completely at the mercy of events happening around you, and being unable to protect yourself — children especially — that reaches the heart and soul of people," she says. James Dorbor, age 8, was suspected of having Ebola. 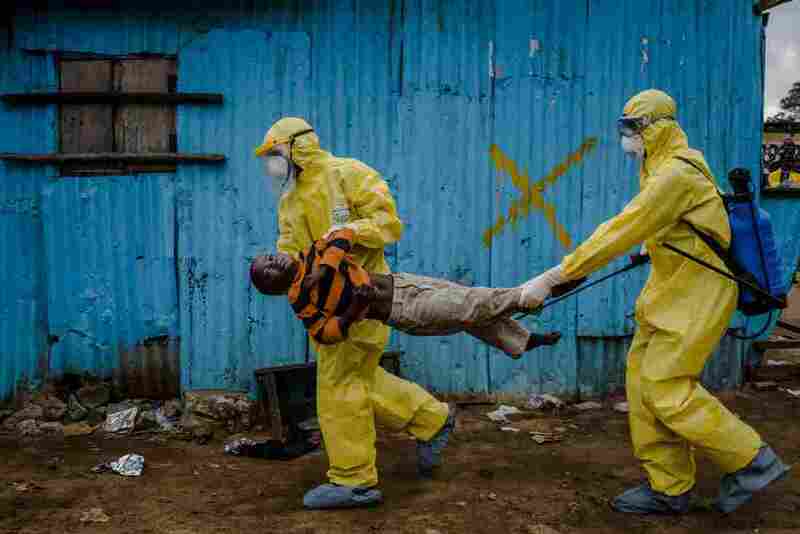 Medical staff in protective gear carried him into a treatment center on Sept. 5, 2014, in Monrovia, Liberia. This year, New York Times photographer Daniel Berahulak won the Pulitzer for his image of 8-year-old James Dorbor, a boy suspected of having Ebola, being rushed into a treatment center in Monrovia, Liberia. The men are wearing protective plastic suits and "are carrying this tiny boy like he was a rag doll," Steber says. Seeing how they hold him far away, "without passion, without connection, was heart-stopping," she says. Even after a long career as a photographer, Guzy says she is still deeply moved by tragic images — including that of 3-year-old Syrian Aylan Kurdi. "You would think you'd form some kind of immunity after working for three decades and seeing the worst of humanity," she says. "But in my case, I've actually become even more sensitive." When she saw the image of him lying on the beach, "I was breathless," she says.